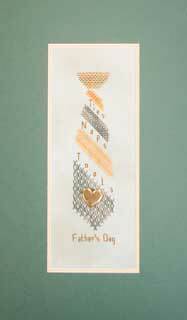 What does Dad want on his special day - ties? tools? or a nap?! Give him all three with this sampler worked with Crescent Colours Camouflage, Roasted Chestnut and Sassy Brass on 28 ct. Thyme hand-dyed Jobelan (can be worked on 14 ct. as well). 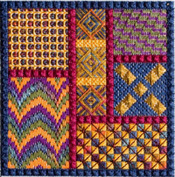 Stitches include web stitch variation, diagonal upright cross, diagonal fern, diagonal cross, oblong cross and backstitch, with a "My Heart Belongs to Daddy" charm included. Finished size 1 3/4" x 7"